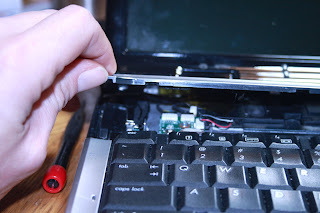 This is the Second Part of How To Disassemble the HP DV9000 series Notebook's / Laptop's Disassembly Tear-Down with photos. 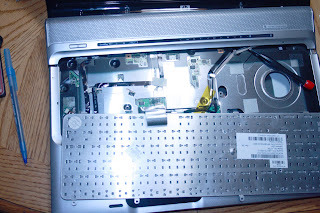 By now you should have all of the screws removed from the bottom of the notebook and now you can proceed with the top assembly. 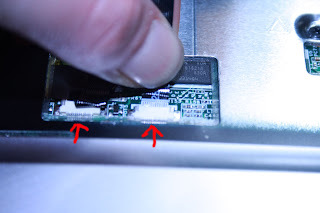 After you flip the notebook over you can start on the Quick Launch assembly / bezel .. carefully start prying on the right side you can see the seems where it will come apart .. if you don't have strong finger nails you can use a cut up credit card (only thing they are good for IMO) to wedge in to the areas to pry up. Do not try to rip the bezel off just yet there are very delicate cables underneath and you don't want to have to buy more of those ... its a long wait for ebay to ship. 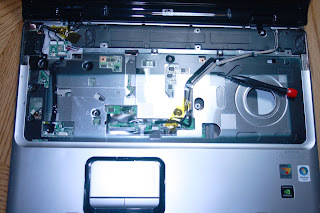 Gently pull the bezel towards the LCD screen to gain access to the 3 screws still holding the keyboard in place ... note the connections and the ribbon cables for the Quick Launch and the Power. Be very careful whit these .. they will damage easy .... and you will be with out the buttons.. or power / sound or both. 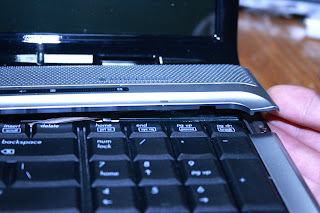 Carefully fold the keyboard back on to the palm rest ... and you can see why we haven't just started to rip things out..
At this time it would be best to disconnect the track pad cable just so you don't forget later and try to pull the top assembly off with this still connected. 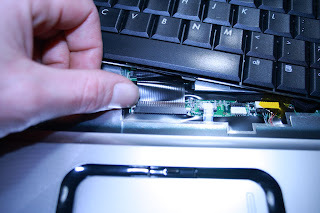 Too the left of the keyboard and touch pad connectors you will the the 2 ribbon cables for the Quick Launch and Power Button. 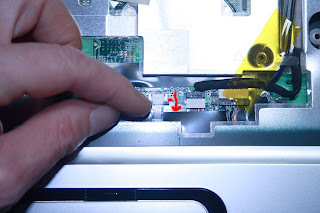 These cables do not have ZIF (zero insertion force) connectors .. in fact they don't have keepers. 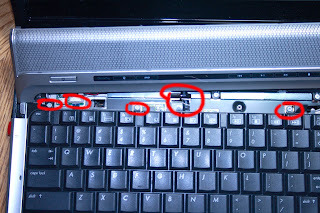 they are held in with friction... for this reason they are a common failure point if you take apart the laptop too many times... be very careful with these ... just pull directly towards the LCD screen and they will come out. Take a Deep breath .... they tricky part is yet to come ... on to part 3 you would be best to go take a break now..... and come back to this.